During a pregnancy, women have to endure a number of changes to their body as their baby develops. Hormone levels are all over the place which can contribute to mood swings and side effects, and then there is the pain and discomfort that comes with it as well. Sciatica pain in particular can cause severe or periodic pain in the lower back and the legs. Fortunately, there are pain management methods and treatments to help alleviate this type of discomfort and make pregnancy as comfortable as possible. Why Do I Feel This Stabbing Pain? Women who develop sciatic pain typically do so during the third trimester, however it is not uncommon to feel pain in the earlier stages as well if sciatic nerve pain was an issue prior to pregnancy. The sciatic nerve, which is responsible for movement and sensation in the legs, runs down the back of the thigh into the lower legs and ends in the sole of the foot. In women, the nerve lies beneath the uterus and makes its journey down the legs. Sciatica pain is a common occurrence during pregnancy, most pregnant will experience at least one episode of sciatic pain. This results from a pinching or inflammation of the sciatic nerve. During pregnancy, the hormone Relaxin is secreted by the placenta and prompts the ligaments to relax to prepare the pelvis for childbirth. As a result, the sciatic nerve shifts and becomes pinched, in addition, the growing baby puts pressure on the sciatic nerve. Unlike mere pregnancy back pain, sciatica pain can lead to sensations of sharp, shooting pain running down the lower back, buttocks area and into the legs. Before taking action to alleviate sciatic pain, it is important to make sure you are not confusing pelvic girdle pain with sciatic pain. Pelvic girdle pain is a generic term for pelvic pain and can occur in the lumbar spine to through the abdomen region and can range from mild to more severe discomfort. Sciatic pain, on the other hand, is more severe than pelvic girdle pain and is marked by a tingling numbness that becomes a sharp pain or burning sensation. Pain caused from a pinched sciatic nerve should only occur periodically and can also cause acute muscle cramps. For those experiencing sciatic pain, it is important to avoid heavy lifting and standing/sitting for long time periods. For physical exercise options, swimming is an activity that helps alleviate the pain since it is a non-impact activity. Classic hot or cold compresses can work wonders, as well. Try each type to see which provides you the most relief. Other alternatives to try, include a warm shower, a doctor-approved anti-inflammatory, or the use of a pregnancy girdle, which can help lift the uterus and distribute the baby’s weight more evenly. Opt for flat shoes, not only is this safer during pregnancy for better balance, but it will also help to keep the spine from jolting while walking. When sitting down, proper alignment of the spine for good posture can also provide further relief. To lie down with minimal sciatic pain, sit on the edge of the bed with both legs together, and then slowly lay down on the side. Sleeping on a firm mattress and using fluffy pillows to support the growing baby bump can also help alleviate pain. Another helpful approach for managing sciatic pain includes a light yoga sequence and regular movement or exercise. Exercise can help strengthen the stomach muscles, hips, spine, back and pelvic floor. Some women may find they still have sciatic pain after giving birth, in which case pain management approaches and exercise should continue to help alleviate the discomfort. It may take a few months after delivery before the pain completely subsides. The piriformis is a muscle deep in the gluteal region, and when this becomes tight, it can irritate the sciatic nerve. To keep this muscle loose, sit on a chair with both feet flat on the ground. Pick one leg up and cross it over the other, resting the ankle on the opposite knee. Keeping a straight back, lean forward until a stretch is felt in the buttocks. Hold this post for 30 seconds and repeat on the other side. During pregnancy, this stretch can feel great whether you have sciatic pain or not. While facing a table or wall, stand with both feet slightly wider than hip width apart. Lean forward while keeping a straight back and place your hands on the table or the wall. Pull your hips away from your hands and feel a nice stretch in the lower back and legs. The hip flexors are the muscles along the front side of the hips. During pregnancy, it is common that these muscles become tight, which can affect pelvic alignment and posture, resulting in pain. To stretch these muscles, kneel on the floor on both your hands and knees. Slowly, step one foot in front of you so that the hip and knee are at a 90-degree angle. Slowly shift your weight forward until you feel a stretch in your back hip and leg. Hold this stretch for 30 seconds and repeat on the other side. A common and very basic yoga series, cat and cow poses can help ease back pain. Begin by kneeling on the ground with your knees under your hips and hands firmly planted in front of you and under your shoulders in a table pose. Using your own breath as a guide, begin by moving into cow pose; inhale as you drop your belly towards the ground and lift your chin and chest and gaze upward toward the ceiling. Next move into cat pose; exhale as you draw your belly to your spine and round your back toward the ceiling, dropping the crown of your head toward the floor. Inhale and return to the starting position. Repeat this sequence. 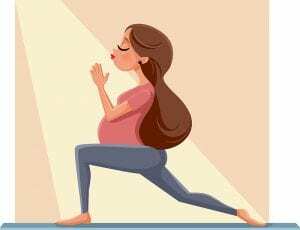 Before beginning exercise during your pregnancy, especially during your third trimester, be sure to check with your physician prior to practicing any new exercise or stretching routines. The natural management techniques above may be sufficient to alleviate pain for some women, but for those who need more help to get relief from pain alternate options can be helpful. Among these therapies, it can help to see a chiropractor regularly, a physical therapist who can assist in strengthening and stretching to decrease sciatic pain, or regular acupuncture therapy. While there is no way to prevent sciatic pain, women who regularly exercise are less likely to experience symptoms during pregnancy. Women who do experience the pain should expect the sciatica to disappear after pregnancy. Try any of the mentioned therapies to alleviate your pain. If the management techniques nor professional therapy help, be sure to speak with your physician to see what other options exist.